The beauty of Project Gutenberg, as those who use it know, is that it gives you no context. All you have is a title and an author and — possibly — a time period. The time period was 1915. The author was one Alice Duer Miller. I downloaded the offending document (grimly, I don’t mind telling you) and steeled myself for whatever nightmare of social engineering lay ahead. I groaned at the grief ahead. The dream of reading breezily on the lake evaporated. (It was 3:15 anyway, and I was hungry.) I helped myself instead to some old bread, sat down in my disgusting kitchen, and prepared for the worst. 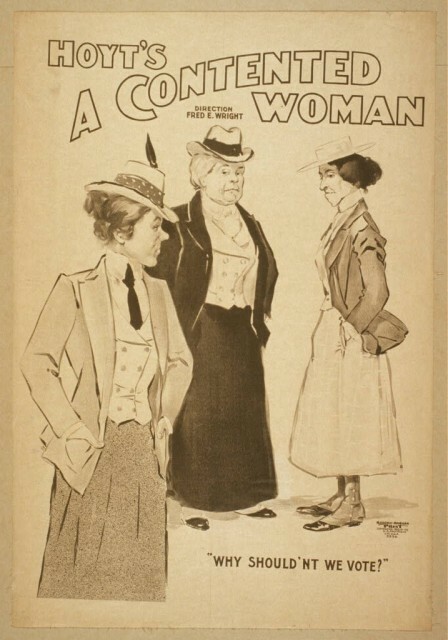 Now, anybody who knows anything about anything (which I didn’t) would have recognized that a) 1915 is way too late for “slave-driver” to carry the absolutely literal dark meanings I read into it, and b) that “Are Women People?” had come, thanks to this very book, to be a famous suffragist catchphrase. They might also know that Alice Duer Miller studied mathematics and astronomy at Barnard (in 1895! ), that several of her stories were turned into movies, that she herself wrote screenplays, and that she’s listed in the VERY FIRST ISSUE of The New Yorker as an advisory editor. She is, in point of fact, a magnificent maven, and Are Women People? is a collection of all the brilliant satirical poems she wrote mocking the anti-suffragists — poems that were published in the New York Tribune. And just like that, my nightmare turned back into a dream. We’ll start with a few so you can get a flavor and feel the same wave of relief wash over you that washed over me. (The parentheticals are all hers — except for this one.) Then you will marvel, and then — THEN — you will decide that there’s nothing for it: the time has come to write sing-songy poems about John Boehner’s stand on abortion, because nothing makes the opposition look as vacuous and morally bankrupt than putting their arguments in rhyme. It’s fitting, since Alice Duer Miller published these in a newspaper, that we start with one mocking the Gray Lady. (Spelt with a little “t”). It’s pay your taxes promptly when it comes to the expense. “I have no home,” I said. It’s patriotic angels when there’s outside work to do. human just as much as you. And failing to pay what you owe. And at this she murmured, “Really,” with the right polite surprise. That you take it personally — women always do,” said he. And how tears heighten woman’s powers! To feel your cook’s afraid of mice. that women have no poise. In 1875 the Supreme Court of Wisconsin in denying the petition of women to practise before it said: “It would be shocking to man’s reverence for womanhood and faith in woman … that woman should be permitted to mix professionally in all the nastiness which finds its way into courts of justice.” It then names thirteen subjects as unfit for the attention of women — three of them are crimes committed against women. 1880 — Anti-suffrage arguments are being worn long, calm and flowing this year, with the dominant note that of woman’s intellectual inferiority. 1890 — Violence is very evident in this season’s modes, and our more conservative thinkers are saying that woman suffrage threatens the home, the Church and the Republic. 1900 — A complete change of style has taken place. Everything is being worn a l’aristocrate, with the repeated assertion that too many people are voting already. 1915 — The best line of goods shown by the leading anti-suffrage houses this spring is the statement that woman suffrage is the same thing as free love. The effect is extremely piquant and surprising. It’s dull for a boy who cannot lead. There, little girl, don’t read. But — the men have less to lose. We are waging — can you doubt it? Who is it thinks the vote some use? Man. And L’Ouverture — remember him? They’d lead a pleasant, peaceful life. Home is where the husband is. Woman’s place is home, I wis.
And man’s is to obey. for a gentleman to do? Risks I could not let you face. Home, you know, is woman’s place. Have no home? Well, is that so? Still, it’s not my fault, you know. And, besides, I need the money. Only let me have your job! He’s always been a suffragist. He’ll think that what he says is true. One of the most interesting parts of the book voices the position of the old-fashioned woman who’s fed up, despite her conservative tendencies, with men bloviating about womanhood. Gotta love it when mother revolts! “How women feel” — he knows that best of all. To the “you will distract us” argument some men advanced against women in the workplace — still one of the most frequently-cited arguments for why women shouldn’t be allowed to serve on the front lines (or in submarines). Watch Ms. Duer Miller strip Mr. Bowdle’s logic of its flattery and expose the loopy misogyny. To open with a tribute to our beauty. To hear you maundering on about our ankles. In 1917, she wrote a follow-up to Are Women People? 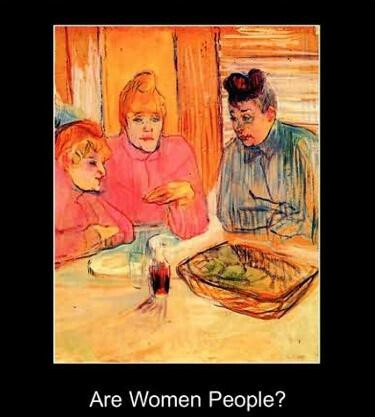 titled Women Are People! YAY! So now we know, and I strongly advise everyone to get a copy and go read the whole thing, scone in hand, by a lake. And then, next time you read a news article that delivers the drivel I expected when I first downloaded this (fool that I was!) — grab your rhyming dictionary and start scribbling. Lili Loofbourow is a writer living in Oakland. She writes about 17th-century ideas of reading and digestion, cognitive science, Chile, and femscularity. She blogs for Ms. Magazine and Excremental Virtue.